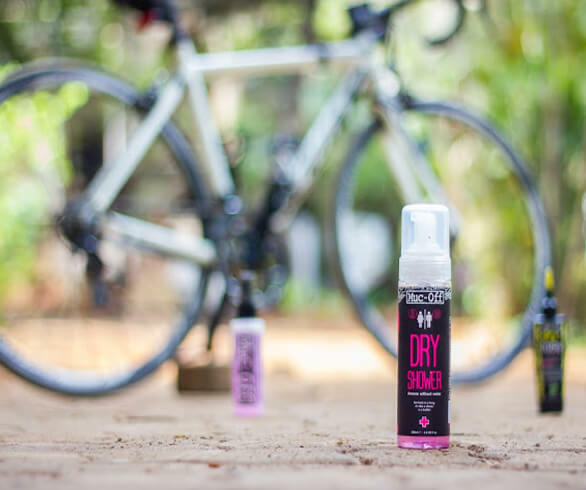 Muc-Off Dry Shower Review - Why should It Be An Essential in Your Bag? The Muc-Off Dry Shower is an antibacterial body wash that comes packaged in Muc-Off’s trademark pink bottle. A smart dispenser makes this 200 ml bottle easy to use and convenient to carry around in a bag or jersey pocket. While it may seem like a sanitiser at first, be sure to not confuse this alcohol-free formula for one. Unlike most soaps that leave your skin dry and damaged, this Parabens and Formaldehyde free formula leaves your skin clean and moist. When we used the product for the first time, the smell of coconut along with easy dispensing and application was very fascinating. All you have to do is get some foam on your hands and apply it on your body. You can either leave it to dry or wipe it off with a towel. Make your choice according to the surrounding conditions while keeping in mind that this process does not require any water. By the time the latter disappears, your skin is free of stickiness and sweat, leaving you clean and refreshed with a pleasant aroma. The unique Muc-Off Dry Shower formula formulated with coconut extracts also makes it a perfect choice for those with sensitive skin. Can you think of any other product that can do this on the move? The Muc-Off Dry Shower is good to be used when you are not too dirty. If you are sweaty and have some amount of dirt the dry shower can help solve the issue of stickiness, odour and germs. If you are thinking of taking a bath with this product it will not be the right choice. It works like a wet wipe that lasts you longer and is more effective. In spite of these few limitations, the product should still make it to your kit bags. The product can be purchased online or from numerous resellers that deliver it to your doorstep without any issues. If you use this product and would like to share your experience, feel free to drop a few lines below in the comment section. Follow them on Twitter by clicking here. Follow them on Instagram by clicking here.